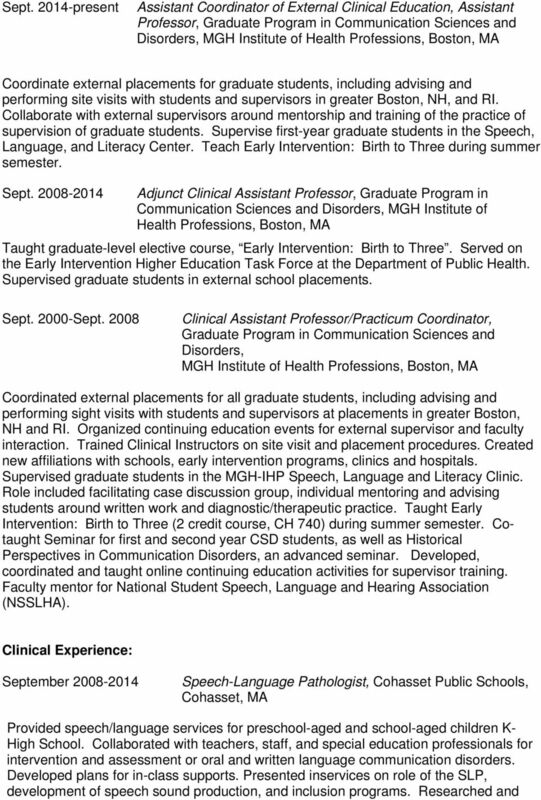 Download "Curriculum Vitae Jennifer E. Mackey, M.A., CCC-SLP"
3 assisted in the implementation of the Stay-Talk-Play Buddy Program with Kindergarten and 1 st grade students. Expertise in working with children with autism, speech disorders, social language disorders, and stuttering. Supervised graduate student interns during school year and summer programs. October 2011-present Speech-Language Pathologist, First Early Intervention, Weymouth, MA Provide speech and language services for children ages birth -3 and their families. 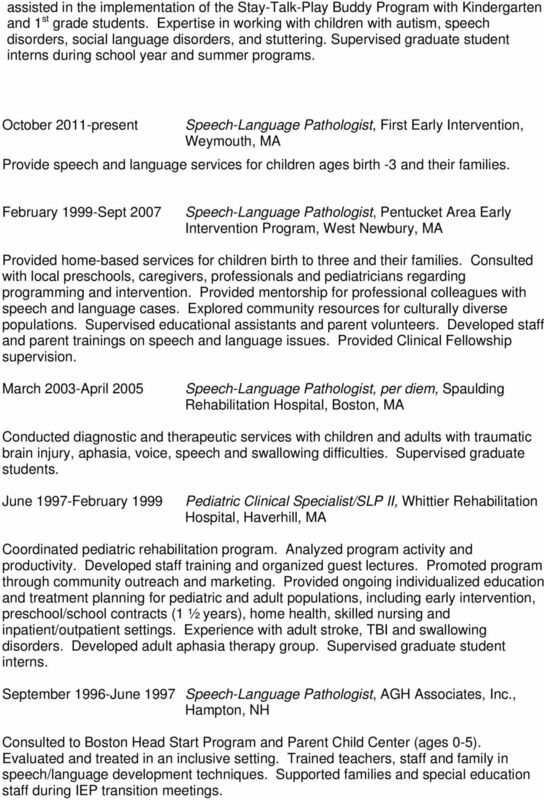 February 1999-Sept 2007 Speech-Language Pathologist, Pentucket Area Early Intervention Program, West Newbury, MA Provided home-based services for children birth to three and their families. Consulted with local preschools, caregivers, professionals and pediatricians regarding programming and intervention. Provided mentorship for professional colleagues with speech and language cases. Explored community resources for culturally diverse populations. Supervised educational assistants and parent volunteers. Developed staff and parent trainings on speech and language issues. Provided Clinical Fellowship supervision. 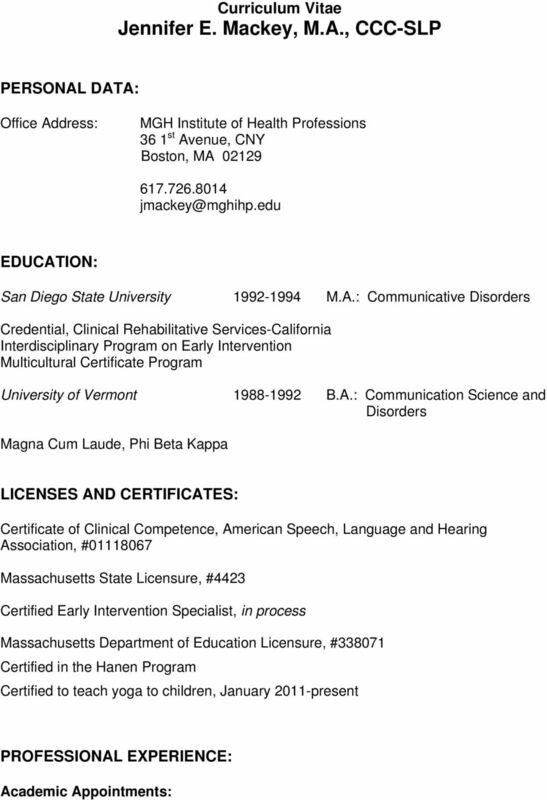 March 2003-April 2005 Speech-Language Pathologist, per diem, Spaulding Rehabilitation Hospital, Boston, MA Conducted diagnostic and therapeutic services with children and adults with traumatic brain injury, aphasia, voice, speech and swallowing difficulties. Supervised graduate students. 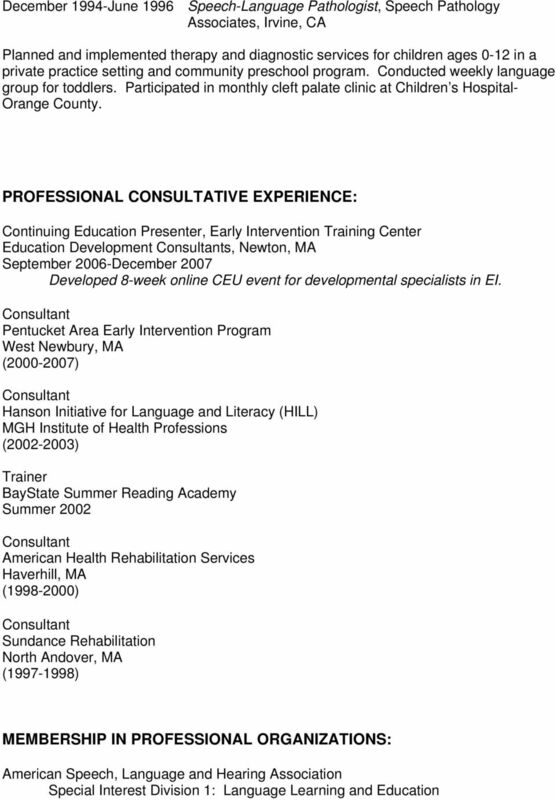 June 1997-February 1999 Pediatric Clinical Specialist/SLP II, Whittier Rehabilitation Hospital, Haverhill, MA Coordinated pediatric rehabilitation program. Analyzed program activity and productivity. Developed staff training and organized guest lectures. Promoted program through community outreach and marketing. Provided ongoing individualized education and treatment planning for pediatric and adult populations, including early intervention, preschool/school contracts (1 ½ years), home health, skilled nursing and inpatient/outpatient settings. Experience with adult stroke, TBI and swallowing disorders. Developed adult aphasia therapy group. Supervised graduate student interns. 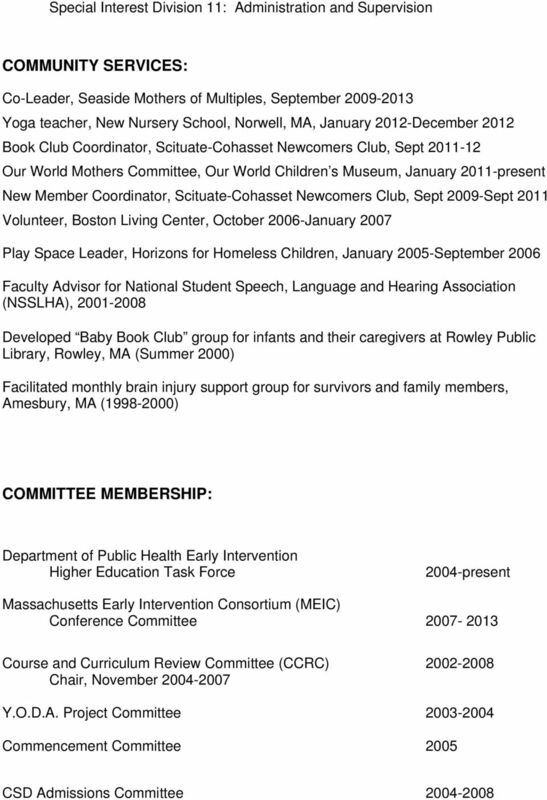 September 1996-June 1997 Speech-Language Pathologist, AGH Associates, Inc., Hampton, NH Consulted to Boston Head Start Program and Parent Child Center (ages 0-5). Evaluated and treated in an inclusive setting. Trained teachers, staff and family in speech/language development techniques. Supported families and special education staff during IEP transition meetings. 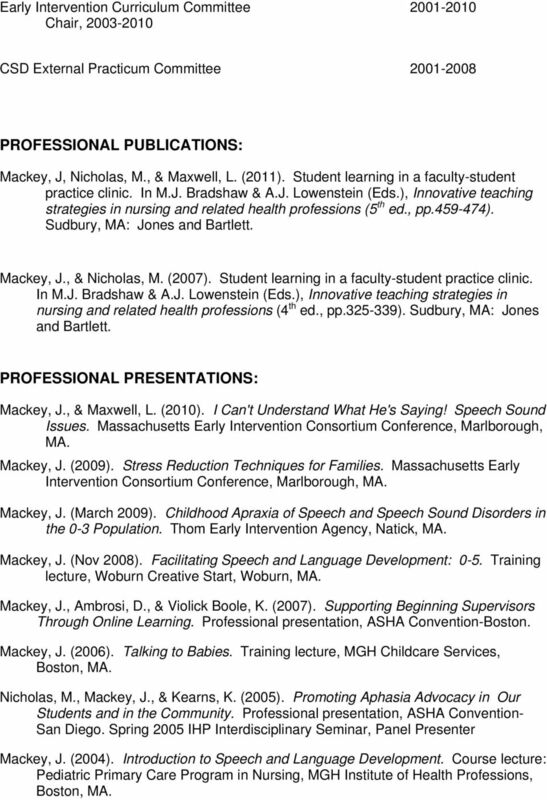 6 Early Intervention Curriculum Committee Chair, CSD External Practicum Committee PROFESSIONAL PUBLICATIONS: Mackey, J, Nicholas, M., & Maxwell, L. (2011). Student learning in a faculty-student practice clinic. In M.J. Bradshaw & A.J. Lowenstein (Eds. ), Innovative teaching strategies in nursing and related health professions (5 th ed., pp ). Sudbury, MA: Jones and Bartlett. Mackey, J., & Nicholas, M. (2007). Student learning in a faculty-student practice clinic. In M.J. Bradshaw & A.J. Lowenstein (Eds. ), Innovative teaching strategies in nursing and related health professions (4 th ed., pp ). Sudbury, MA: Jones and Bartlett. PROFESSIONAL PRESENTATIONS: Mackey, J., & Maxwell, L. (2010). I Can't Understand What He's Saying! Speech Sound Issues. Massachusetts Early Intervention Consortium Conference, Marlborough, MA. Mackey, J. (2009). Stress Reduction Techniques for Families. Massachusetts Early Intervention Consortium Conference, Marlborough, MA. Mackey, J. (March 2009). Childhood Apraxia of Speech and Speech Sound Disorders in the 0-3 Population. Thom Early Intervention Agency, Natick, MA. Mackey, J. (Nov 2008). Facilitating Speech and Language Development: 0-5. Training lecture, Woburn Creative Start, Woburn, MA. Mackey, J., Ambrosi, D., & Violick Boole, K. (2007). Supporting Beginning Supervisors Through Online Learning. Professional presentation, ASHA Convention-Boston. Mackey, J. (2006). Talking to Babies. Training lecture, MGH Childcare Services, Boston, MA. Nicholas, M., Mackey, J., & Kearns, K. (2005). Promoting Aphasia Advocacy in Our Students and in the Community. Professional presentation, ASHA Convention- San Diego. Spring 2005 IHP Interdisciplinary Seminar, Panel Presenter Mackey, J. (2004). Introduction to Speech and Language Development. Course lecture: Pediatric Primary Care Program in Nursing, MGH Institute of Health Professions, Boston, MA. 7 Mackey, J. & Maxwell, L. (2002). Writing Cases for Discussion-Method Teaching. Professional presentation, ASHA Convention-Atlanta. Mackey, J. (1999). Speech and Language Development: 0-3. Course lecture: Infant Toddler Program Planning, Office of Childcare Services, Lead Teacher Certification. Middlesex Community College, Lowell, MA. Mackey, J. (1998). Articulation, Phonology and DVD: What s the Story? Lecture. Haverhill Public Schools, Haverhill, MA.